Join us as we learn to use two colors to create this fun cowl. Fiddleheads are back! Learn to knit these 2-color lined mittens in this 2-session class. We'll discuss I-cord cast-on, yarn dominance, and sizing. You must be comfortable knitting in the round on either double pointed needles or using magic loop. Always wanted to get the needles clicking? In a tangle with all that lovely yarn? Or, do you know how to knit and just need a refresher course? This is the class for you! 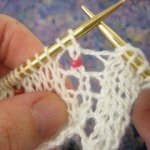 We will cover a basic cast-on, knitting, and purling. We will talk about yarn, patterns, all things knitting! Knitting is relaxing, meditative, and so satisfying! Knitting, woo-hoo! Receive a 10% discount on your yarn when purchased for the class. Our kick off Tips and Tricks Saturday will be Kitchener Stitch. We have all struggled to remember how to get it started, when to drop what stitch??? Nancy will be teaching us all how to remember this wonderful grafting method. Come learn about Short Rows! We will be looking at wrap & turns as well as German Short Rows this morning. Have you ever wondered how to use beads in your knitting? Several methods will be covered during the hour to include beads in your knitting.